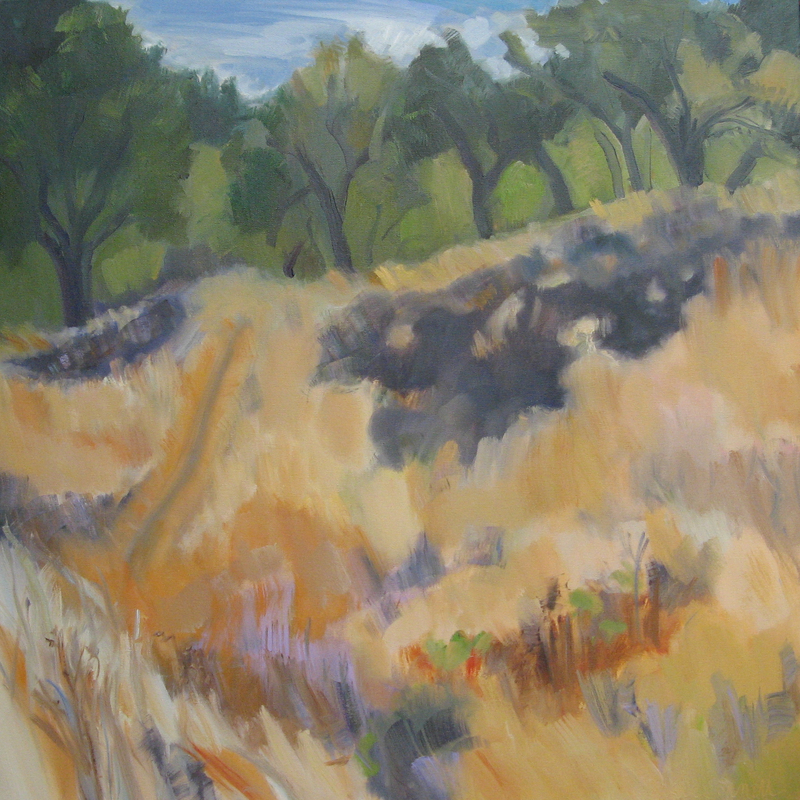 Several of my landscape painting students became so engaged with Pepperwood Preserve as painters that they completed the year’s class called Bio/Erths 85, and became certified as California Master Naturalists, and then interned as Pepperwood Stewards. Bill Gittins initiated the seasonal painting concept as his intern project. I was delighted to say yes to his invitation to join him and a small group of painters in each selecting a view to document by painting at the seasonal markers. 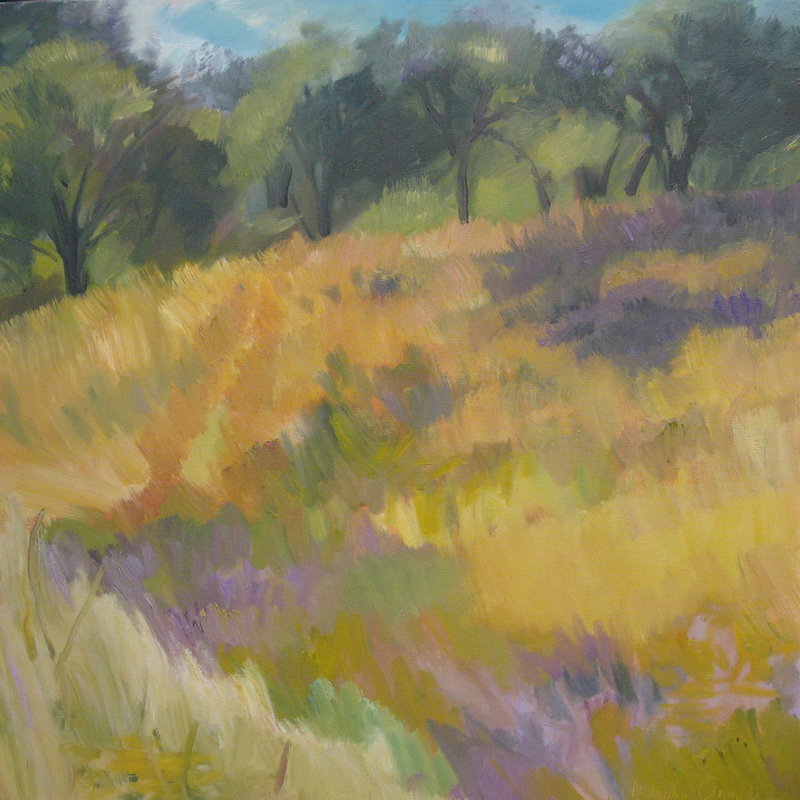 The “Seasonal Painting Project” was exhibited at the Pepperwood Gallery during two annual Spring Wildflower Festivals. In addition to teaching landscape painting and drawing, through the Santa Rosa Junior College Art department and through the Pepperwood Foundation, I’ve been part of the teaching team for the Bio/Erths 85 class, which was developed as a model for California by Santa Rosa Junior College instructors. I lead the introductory field day, teaching students sketching skills as a valuable observation tool in creating field journals. My notes about these paintings are related to the format students learn for field journal descriptions. . .artist’s style. December 19, 2011. . . Winter Solstice painting. December 16, 2011. A sunny winter day at Pepperwood, scouting for a Pepperwood site to paint over the next year, one that will evidence changes in four seasons along the steep road to Double Ponds. As I leave, a coyote crosses the opposite hillside! Dec 19, 2012. Chill mornings of the past few days are slightly warming today. The painter and the naturalist observer parts of myself dialogue. I’m drawn to reflections of oaks in the larger and closer of the Double Ponds. The pond, still in its almost evaporated summer state, is just a tiny part of the landscape, after a dry fall and winter. I’m interested in documenting its shape-shifting through the year. I want to include also the bare-branched trees above the pond, and the bluish mountains behind them, and the hill rising steeply with oaks at the top to the right. A lot to ask of one canvas! 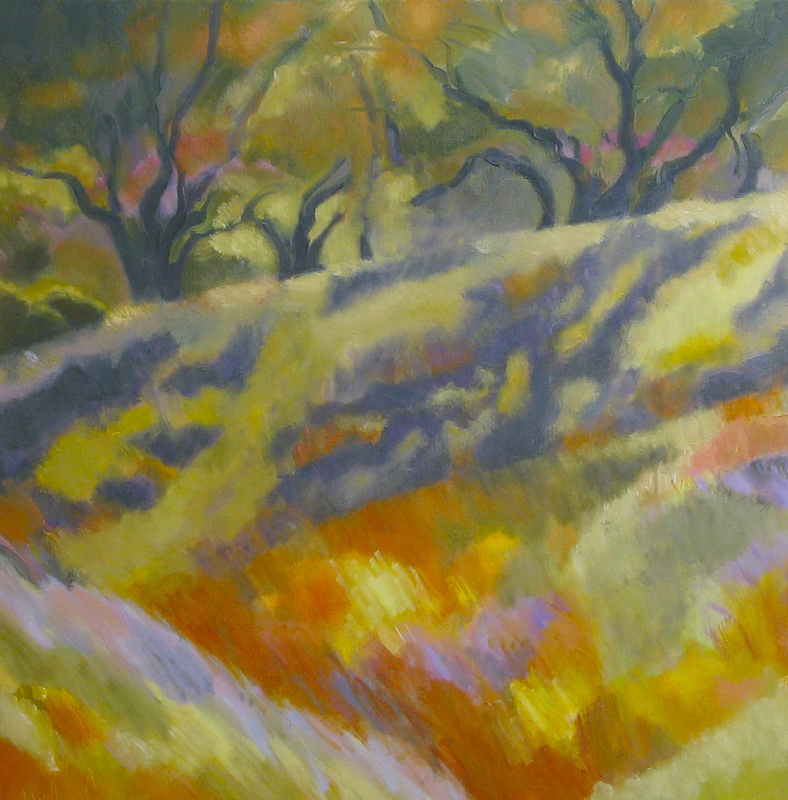 With the pond behind me as I walk to the car for easel and paints, I’m struck by the long winter shadows in front of me on a dry golden hillside, cast by oaks on the ridge. They symbolize the equinox slant of the sun’s rays for me. I wonder if spring wildflowers will emerge in the hollow below the first hill. . . I think I have found my subject. Coyote—trickster, transformer, creator— marked the spot. 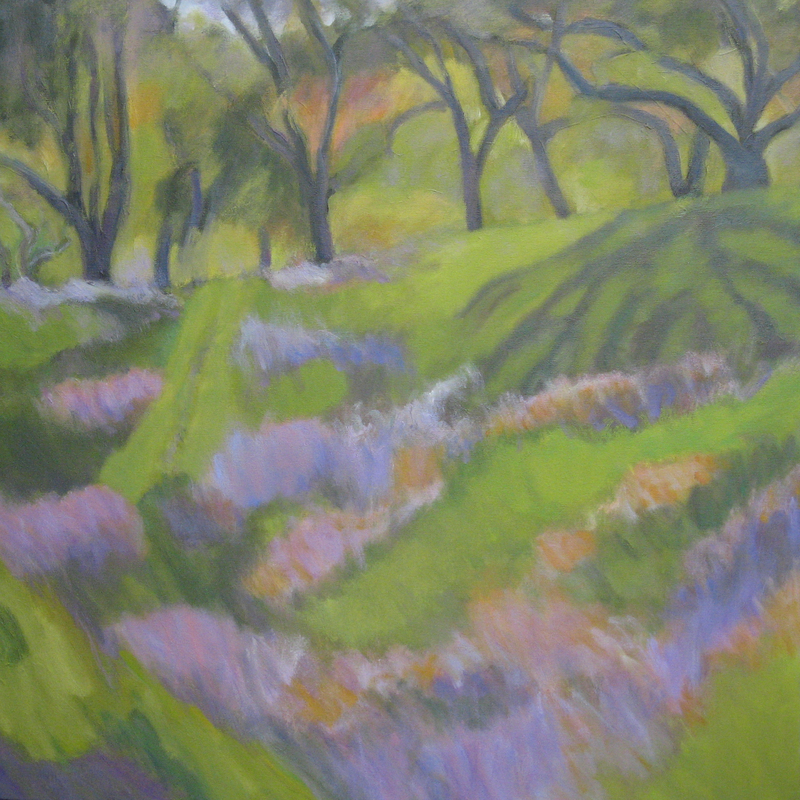 March 29 and April 1, 2012. . . Spring Equinox painting. It has rained at last and I stand in a soggy field, dramatic gray and white sky, late morning, momentary shadows in a day of flat light. The path to Double Ponds is mud-sticky. The pond is quadrupled, or larger, overflowing, and dull muddy browns. The single pond likewise. A little water flows in the low spot at the base of my hill, under the dried grasses. So much green now! Last season’s dried grasses, lavender gray, pinkish, occasionally golden, stick up through tender new growth. Some trees are just leafing out, others have fuzzy halos. Light once again strikes the next hillside layer behind the top oaks. I manage to complete an “underpainting” until there is just too much rain falling for the oil paints to stick to the canvas. When I bungee cord all together, gamely continuing, the whole setup blows over! I regroup once more, trying to maintain my joy and sense of humor, remembering a lecture I once heard on “The Pleasures and Pains of Outdoor Painting.” So the painting becomes a record, of the time of the equinox, distilled from two close together but not identical days in the Pepperwood landscape. How sweet and evanescent was the season of spring green meadows sparkling with wildflowers. Now a gentle breeze blows away morning fog, sets aquiver the drying grasses of the golden hills of California. Colors have faded, except in the hollows. A few places up the hillside have green undertones (are there springs there?). A very small stream follows the contour of my perch to an unnamed pond ahead. I think it goes under the road from Double Ponds behind me. Here it is still moist enough to support greens, purples, golds. I stand near the edge of the hill to watch these seasonal changes, to observe when there is moisture below, and how it affects vegetation, well as to watch the changes in color and shadow patterns up the hillside to the treeline. I return to my spot near the juncture of Double Ponds’ Road. Ouch! My socks fill with stickers as I carry my supplies across the knoll. So many dried and spiky plants, thirsty for the first autumn rains to come. The oaks are a full canopy and cast longer and deeper mid-day shadows than three months ago. A windless late morning, rising thermometer, pushes me to take a break in the only shade, next to my car. Georgia O’Keeffe used to go under her Ford Model A in the desert! Now, in the fourth painting over a year at the same site, I have absorbed the configurations of shapes, space, trees and sky of my view. I have it in my body. I have documented and responded to the shifts in color and texture that demark changes in ecosystems. Although in the end I didn’t paint the ponds, they were always part of my consciousness. In each season’s song, the same structures repeated as the themes, but different aspects asserted themselves in each variation, a Pepperwood sonata. Marsha, I particularly enjoyed reading about your work, as you paint with words as well as your brush. What really resonated with me was understanding how you perceive the natural world in fine detail, or in a different manner like a naturalist, noticing what others might not, especially with the plein air work at Pepperwood Preserve through the seasons. I’d love to see more of this in book form. Thank you, Mimi. Walking the hills and drawing them, dancing with trees and painting them, meditating in a field with opened eyes and ears, skin and nose, planted like a wildflower. . .these are some of my entryways into a deepening relationship with the natural world.